Thousands of car enthusiasts enjoyed a fun-packed day at the Uxbridge Autoshow at Middlesex Showground, on Sunday 19th July 2015, with this year’s Event raising over £38,000 for Local and International Charities. The weather was fine and warm and the public flocked in their 1000’s to support the Annual Auto Show. “The ‘Show’ which is the jewel in the crown of the Rotary Club of Uxbridge, takes months to prepare with the date being set soon after the previous year’s Event but to see the cars arriving and the crowds queuing at the Entrance Gates makes it all worthwhile.”, said Mike Crane; President of the Rotary Club of Uxbridge (2015/16). This year’s Event provided an opportunity for spectators to browse; vintage and specialist vehicles including commercial and military vehicles, the London vintage taxi association vehicles and to be entertained by ‘Moto Stunts International’; performing an array of stunts including two-wheel driving, wheelie and Jeep rollovers and trick riding on Quad Bikes and Motorcycles with high speed crossovers. Back by popular demand, this year’s Event also saw the return of the Music Stage; a crowd puller at the 2014 Event, show casing some of the local talent Musicians from across West London including; ‘The Milly So Band’, ‘The Rockin’ Mustangs’, ‘Donnie Duo’ and ‘Twos Company’. The Annual Prize Giving was honoured by the attendance of various Rotary and Civic Dignitaries, with the Mayor of Hillingdon Cllr. George Cooper, one of the Clubs longstanding Members presiding alongside the District Governor Rt. Fred King, and the Clubs current President Rtn Mike Crane. The Barclays Charity Marquee once again played home to some of Hillingdon’s locally based Charities including; Hillingdon Shopmobility, RSPCA Hillingdon & District Branch, Hillingdon Autistic Care & Support, Life Education Centres Hillingdon, Mencap Hillingdon South, Jubilee Pool, Harefield Hospital, Hillingdon Brain Tumour Group, Michael Sobell Hospice and Social Activities Multiple Sclerosis, who between them raised, including the added Barclays Bank Charitable Donations a whopping £5,980. On the day. Rtn. 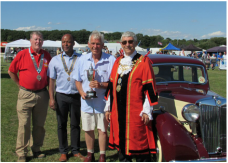 Alan Morris; Autoshow Committee Chairman, said that the, “Organisers of the Rotary Club of Uxbridge AutoShow expect a record result after beautiful weather boosts attendance at this year’s Show’ and he was not wrong. With over £38,000 raised for Charity, this is the Clubs best year ever….however the Club is already committed to the AutoShow 2016 and looking to smash this year’s record. This year numbers attending rose by 30% on last year. As well as enjoying the vast variety of cars on display, show-goers could enjoy live music, food and a large fairground.